Cornerback Ronald Darby is in the fold for 2019 and we’ve got him one-on-one in this latest Eagles Live Podcast. Darby discusses his decision to return to Philadelphia, his speed to burn and he takes his turn answer our 5 Questions With as well as the hilarious “Ron, Ronald and Ronnie” Trivia Game. The NFL has some important new rules in place for 2019 and we’ve got the answers for you here in this exclusive interview with Jon Ferrari, the Eagles’ vice president of football operations and compliance. It’s a must listen to get you ready for the season ahead. Tune in NOW! Running back Jordan Howard is eager to dig in and help the Eagles offense after being acquired in a big trade and we’ve got him in the studio to have some fun! Also, Merrill Reese stops by to discuss the many moves the Eagles have made in this offseason. Tune in NOW! In this jam-packed Eagles Live Podcast, RT Lane Johnson visits and talks about his rise to stardom after beginning his football career as a QB, and he also breaks down a 40-yard dash among the #Eagles offensive line, and Vinny Curry and Andrew Sendejo kill it in their 5 Questions segment. Tune in NOW! WR DeSean Jackson loves the “crazy” Eagles fans and he’s glad to be back, Malik Jackson can’t wait to pair with Fletcher Cox at DT and LB LJ Fort may just be the new “Invincible” Eagle. Get to REALLY know the new Eagles in free agency with the latest Eagles Live Podcast that also includes Merrill Reese’s take on the early days of the 2019 free agency period. The game has changed for offensive lineman and we talk about that and a whole lot more with former Eagles OT Tra Thomas, a three-time Pro Bowl player who is now the morning co-host on 97.5 The Fanatic in Philadelphia. Tra talks about his time in Philadelphia, what really happened with Donovan McNabb in Super Bowl 39 and how he thinks the Eagles are shaping up for 2019, including a look at the team’s offensive line. Listen in to the latest Eagles Live Podcast NOW for a fascinating conversation with Tra Thomas, one of the all-time great LTs in franchise history. Dave Spadaro brings another edition of the Eagles Live! Podcast with an exclusive interview with Brandon Graham on his contract extension. The Eagles have made the decision to allow QB Nick Foles to enter free agency, so what does that mean for the position? We talk about that as well as going in-depth with LB Paul Worrilow, who talks about everything from growing up in Delaware and starring at the University of Delaware to his decision to re-sign with the Eagles for 2019. It’s the Eagles Live Podcast! Join in NOW! Hugh Douglas join Dave Spadaro to talk about his time with the Eagles, his relationship with Terrell Owens and more! Eagles Hall Of Famer Seth Joyner joins Dave Spadaro and talks about the past, the present and the future of the Philadelphia Eagles, along with Seth's time at the Eagles and his overall defensive philosophy. Eagles Live Podcast: Where Does Roster Need Most Help? Ike Reese joins Insider Dave Spadaro for an in-depth conversation about the #Eagles and what is ahead in the offseason to come. Tune in NOW!! The 2018 season is over and now we’re looking ahead to 2019 on the newest Eagles Live Podcast. Doug Pederson, Howie Roseman and Merrill Reese talk about what’s ahead for the Eagles as the offseason begins. Tune in NOW! ….  Eagles Live Podcast: How Can Eagles Win In New Orleans? ESPN’s Sal Paolantonio and The Voice Of The Eagles Merrill Reese conduct a roundtable conversation on the Eagles-Saints, head coach Doug Pederson talks about another road challenge and safety Malcolm Jenkins gets real breaking down New Orleans. Tune in NOW and get jacked for Sunday! Eagles Live Podcast Instant Reaction: Heart-Pounding Win Sends Eagles To New Orleans! A late touchdown drive gave the Eagles the lead and then a missed field goal at the end preserved a 16-15 Eagles win over Chicago on Sunday in the NFC Wild Card playoff game. We take you to the scene of the win as the team celebrates its win. It’s the Eagles Live Podcast Instant Reaction. Tune in NOW and re-live an incredible ending to a hard-fought Eagles victory. Eagles Live Podcast: Chicago, Here We Come! The Eagles are ready for the NFC Wild Card Playoff game in Chicago on Sunday, and we’ve got it all covered right here. We have a one-on-one interview with DE Michael Bennett, chat with Zach Ertz about the team’s turnaround, have our weekly exclusive one-on-one with head coach Doug Pederson and hear from Merrill Reese, Mike Quick and Brian Westbrook about the matchup against the 12-4 Bears. Get ready for the game here with the Eagles Live Podcast. Tune in NOW! Eagles Live Podcast Instant Reaction: Playoffs, Here We Come! A dominating 24-0 win over Washington coupled with Chicago’s victory in Minnesota sends the Eagles into the NFC postseason, which starts for Philadelphia on Sunday in Chicago. Let’s go into the locker room and hear from the players and head coach Doug Pederson after the team’s fifth win in six weeks completely turns the season in the right direction. It’s the Eagles Live Podcast Instant Reaction. Tune in NOW! Eagles Live Podcast: One Final Sunday To Reach The Playoffs! A win over Washington and a Chicago win over Minnesota lands the Eagles in the playoffs! We’ve got segments with Merrill Reese, Mike Quick and Brian Westbrook talking about the journey of this 2018 Eagles season and one-on-one time with head coach Doug Pederson and standout rookie CB/S Avonte Maddox. This is an Eagles Live Podcast that you just can’t miss. Tune in NOW and get ready for a crazy Sunday ahead! The Eagles keep their playoff hopes alive with a 32-30 thriller and we have the Instant Reaction right here! QB Nick Foles threw four touchdown passes and the Eagles put together a final drive in the last two minutes to upend the Texans. It was an incredible football game and we have the great coverage to prove it! Tune in NOW! As the Eagles prepare for another must-win game against Houston, we do in-depth with conversation about what makes Nick Foles tick in this Eagles offense. We’ve got our weekly exclusive interview with Doug Pederson, we hear from Foles and both ESPN’s Sal Paolantonio and the Voice of the Eagles, Merrill Reese talk about the Eagles with Foles playing the QB position down the stretch. Tune in NOW! Get the Instant Reaction here from a jubilant Eagles locker room after the team’s 30-23 win on Sunday night in Los Angeles. It’s a win that moves the Eagles to 7-7 and right in the thick of the NFC playoff picture. We hear from QB Nick Foles, head coach Doug Pederson and a host of Eagles after the super-important road victory. Tune in NOW!!! It could be Carson Wentz. It could be Nick Foles. The QB position has been in the spotlight all week as the Eagles gear up for a big challenge against the powerful Rams on Sunday night. We dig deep into the quarterback position and what it means for the Eagles in this game and in the future. Tune in NOW! We’ve got a full slate of action from INSIDE the NovaCare Complex with the latest Eagles Live Podcast – a one-on-one interview with head coach Doug Pederson and offensive tackle Lane Johnson, in-depth analysis from the coaches on the Cowboys and a trip deep inside the Eagles’ locker room as the Eagles prepare for Sunday’s NFC East battle at Dallas. Tune in NOW!